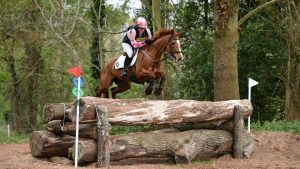 With many hunter trials and one day events taking place at this time of year, and of course the event season still in full swing we have some great offers on cross country clothing for you! Our lightweight skins are ideal for cross country riding. They come in a choice of two colours; red or pink. 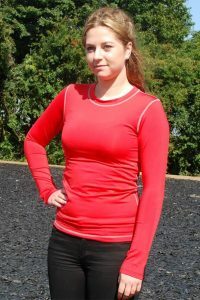 The phrase ‘easy-tech’ as coined by Selwood.com is ideal for these lightweight and soft base layers. They are both easy to care for and technical enough to provide quick drying compression and to regulate body temperature. The easy-tech base layer not only regulates body temperature but also keeps you warm and dry on cold days. The soft close fits means this garment is suitable for all sports and feels like a second skin for the wearer. This item is an ideal XC skin. Fabric make up is 90% Polyester, 10% Elastane and we advise that to prolong the life of your garment, you wash at 30°C inside out. When it comes to breeches, we have two great styles to help keep you comfortable and secure whilst in the saddle. Two of our popular Kenzia styles are ideal for cross country riding. With one offering a full seat and the other a gel grip system on the knee, for added security. The Kenzia full seat breeches have two front slant pockets and a shaped seat. They are made of 16% Coolmax microfiber, 79% Tactel, 5% elastane, with a full seat in suede. This Coolmax/Tactel combination makes the fabric not only waterproof, breathable and stain resistant. But also lightweight, soft and comfortable. They are embellished with a metal badge over the right pocket and a Tattini embroidery down the left side. Stretchy fabric insert at the ankle. The Kenzia Platinum breeches are both a lightweight and comfortable riding breech. The coolmax/tactel fabric combination makes these breeches waterproof, breathable and stain resistant. Easy to wear for both competing and day to day. They have two front slant pockets and a shaped seat. They look suitably stylish and are super comfy in or out of the saddle. Added silicon gripping provides the rider with a secure grip and stability to the knee area. The embellished metal badge over the right pocket adds a fashionable finish to the overall design. Complete with tattini embroidery down the left side and stretch elastane at the ankle area for a great fit under riding boots. Made From 16% coolmax microfiber, 79% tactel and 5% elastane. We offer a next day (if ordered before 11am) or a standard 3 – 5 day delivery service, or if you are local to our Suffolk office you are welcome to give us a call, come in and collect your preferred items to save on postage costs! Take advantage of some great online offers this week and get yourself a smart new cross country outfit ready to compete in style!